Every week you will be given a set of tasks such as "make a forum post" or "watch a video". For each task you complete you earn tickets to a weekly raffle in which you can win an Apple device, digital software on STEAM or one of the cash prizes up to $50. Complete the tasks from your task list, the more the better. Collect raffle tickets for each task you have completed. The more tickets you earn, the higher your chance to win. Click on the orange circle in the website header to open a list of all tasks that are currently available to you. The number in the circle indicates the number of tasks you are yet to complete and can still earn tickets for. Each task in the list provides you with instructions on how to complete it and how many raffle tickets you will be awarded. Every week on Sunday at midnight, you'll take part in a raffle with all the tickets you earned during the week. All tickets go into a pot and we randomly pick a winner. This means: the more tickets you collect, the higher your chance to win. Details on how much time you have left until the next raffle and how many tickets you've already collected for the next raffle can also be found when clicking the orange circle in the website header. Every week one lucky winner will be pocketing a brand new Apple device or multiple games on STEAM, while nine other winners will be drawn and awarded a cash prize between $10 and $50 (see the table below). The money will then be added to each winner's Tell-a-Friend account. Every registered member of PokerStrategy.com can participate, other than members that were excluded from our Tell-a-Friend program and full time employees. Who picks the winner? Do we get a photo of her? It's computerised, just a box with wires inside, nothing exciting to see. We'll publish a news with the previous week's winner every Monday. We will also contact you via customer service ticket. In the table below you find an overview of all tasks, and the conditions you need to meet to complete the task. The qualification period for the PokerStrategy.com weekly raffle will commence each Monday at 00:01 UTC and close each Monday at 00.00 UTC (the “Promotional Period”). The raffle prizes are subject to change and are being announced on Mondays for the current week via our news articles, then raffled on the following Monday. d. comply, at all times, with these and all other PokerStrategy.com terms and conditions. 2. 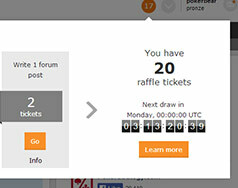 Entrance to the raffle is by virtual “tickets”, which can be earned by completing specific tasks which PokerStrategy.com shall publish on its website (“Tasks”). 3. For each task completed to the sole satisfaction of PokerStrategy.com a certain number of predetermined “tickets” will be awarded to the participant. 4. Any prizes awarded must be claimed by the relevant participants within 30 days of the date of the Weekly Raffle, any prizes not claimed within this time will be subject to forfeit. 5. PokerStrategy.com reserves the right to exclude any individual from participating in the Weekly Raffle for any reason whatsoever including, but not limited to, spamming of forums, creation of fake user accounts, fraudulent activity, breach of any PokerStrategy.com terms and conditions etc. 6. PokerStrategy.com reserves the right to make any changes to the tasks, Weekly Raffle prizes and/or prize structure as it sees fit including, but not limited to, substituting any prize awarded for another of equal or greater value, or its equivalent cash value. 7. PokerStrategy.com shall not be liable to any Weekly Raffle participants for any errors and/or omissions in Task descriptions, or for any other reason whatsoever. 8. Any taxes due in connection with any Weekly Raffle prizes (including any VAT and/or import duty) are the sole responsibility and liability of the winner(s). 9. By participating in the PokerStrategy.com Weekly Raffle and indicating that you wish to accept any prizes awarded to you, you are specifically agreeing to be bound by these promotional terms and conditions.